Adaptil Express Tablets are intended to relieve your dog’s stress and anxiety during one-off events such as fireworks and thunderstorms. Made with natural ingredients, these tablets are a unique combination of amino acids and vitamins, providing a fast and temporary calming effect on your dog during events that cause stress. 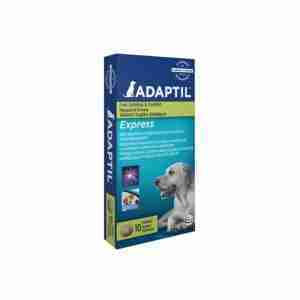 Adaptil Express tablets are not pheromone based. If you have noticed your furry friend showing signs of stress during events that produce loud noises, administer Adaptil Express Tablets 2 hours beforehand and it will help to ease the stress and make your pet feel comfortable. If your dog is extremely anxious, stressed and unsettled, try combining the tablets with the Adaptil Diffuser which releases a synthetic version of the pheromones that mother dogs release to let puppies know they are safe. Tried these on my very stressed out dog, Alfie on bonfire night and they seemed to work. He's had diazepam before which didn't help with the stress but just made him extremely wobbly on his feet, probably causing him more anguish. On bonfire night though he just laid in his den; until it was all over. We're going to try them next time he goes to the groomers in the hope if works with that scenario too! !